The new member of the Viapro Extra product line is the Viapro Extra Zoom which is a food supplement pill for men for regular use. 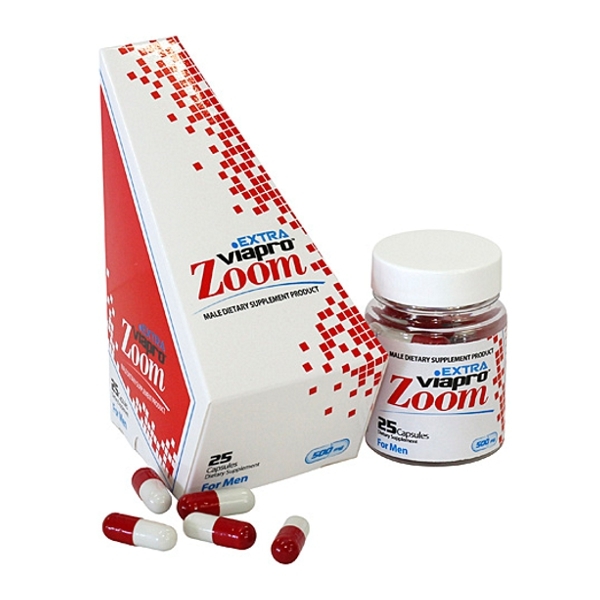 The new member of the Viapro Extra product line is the Viapro Extra Zoom which is a food supplement pill for men for regular use. Numerous men may experience that with increasing age their performance declines which can result from many reasons (among others smoking, harmful environmental effects and improper eating habits). This food supplement can provide solution for those who consider the indulgence and pleasure of their partners and their own pleasure important. The product contains 100% herbal ingredients. It is recommended to use Viapro Extra Zoom every day with a break after each five-day period. Ingredients: clam extract, Mumio, Saw palmetto, Maca, buck-horn extract, Chinese Cordyceps extract, Nettle, Sarsaparilla, goat’s-thorn (astragalus), Licorice, Oat straw, L-arginine, Guarana. Suggestion: Take one day break after each 5 day period. Do not overdose the daily recommended dosage. People under 18 must not use the product! The product should be kept away from children in a cold and dry place! This food supplement is not a substitute for various diet and healthy lifestyle.